A perplexing aspect of the second book of Thomas More’s Utopia is the obvious moral superiority of the Utopian pagans in comparison to their ostensibly Christian European counterparts as depicted in Book One. Why is it, many have asked, that one so pious as More would present such a virtuous community of pagans. The obvious answer to this riddle is that More intended to offer the Utopians as an ironic foil to the vice-ridden Englishmen of Book One. Is there a better way for More to demonstrate how unchristian his countrymen are than to compare them unfavorably with heathens? This reading of the dialogue is best defended by examining its construction: Thomas More catalogs various forms of European depravity in Book One in order to remedy them in Book Two. This is a nice, neat thesis. However, it is inconceivable that More, a man who died in defense of religious and political principles, would seriously propose that the ideal society was an odd form of pagan totalitarianism. So what the devil was More up to? Many critics who have rightly rejected the notion that More was seriously suggesting that Utopia represented an ideal society have proposed that, in addition to satirizing the sorry state of European civilization in Book One, he was also lampooning all efforts to improve society in Book Two. In this vein Richard Marius suggests that, “More meant his readers to rebuke Raphael rather than praise him.” Perhaps; however, we should do both. Raphael should be praised for recognizing that Tudor England was in need of reform but rebuked for proposing solutions which disregard the folly of human perfectibility. The vigorous nature of the attacks on the rampant injustice in English society which More makes in Book One repudiate anyone who would argue that More’s singular objective in writing Utopia was to lampoon those who would try to create a perfect society. It is true that the Utopians are in many ways like “a doctor who cures diseases by creating another,” but the extreme nature of the diseases illustrate the high level of repugnance he feels for the ills which plague his society. More is offering serious medicine to combat serious ills. As with Swift’s A Modest Proposal, the drastic nature of the remedies proffered in Book Two of Utopia is a cogent reminder of how hideously unchristian English society was. By proposing such ridiculously severe solutions, More highlights the prevalence of greed and corruption in sixteenth century England. Considered as a whole, the two books of Utopia compose a convincing repudiation of Tudor society. In Book One More paints an unsightly portrait of the manner in which the nation was ruled; in the second book he creates a pagan society which is morally superior to it in many was. More is not suggesting that paganism is preferable to Christianity; rather, he is asserting that the Europeans are so unchristian that they are put to shame by comparison to a prechristian society. More’s most strident criticism is directed at the harsh economic disparities in England and the political corruption which fostered a system which was grossly unfair to those at the bottom. The first evidence of the excessively unjust nature of this system is the debate on public hanging, a practice which “goes beyond justice and beyond the public good.” As is pointed out later in the discussion, capital punishment for petty crimes is an extreme measure, far more severe than the penalties prescribed for thievery in the Old Testament. Although Book Two of Utopia is clearly no “model for reform” it has two functions: It simultaneously mocks those who would insult God in their attempts to create a heaven on Earth while it emphasizes the religious hypocrisy of More’s age. If More’s solutions would often throw out the baby with the bathwater, they nevertheless emphasize how putrid that water has become. Of course it is silly to make golden chamber pots. But this silliness emphasizes how the love of gold caused wealthy Englishmen to replace peasants with sheep. Many of the solutions to England’s ills proffered in Book Two are absurd, and it is this very absurdity which accents what a corrupt society More’s England was. Such is the power of satire. Because Thomas More proposes perfectly reasonable political reforms alongside such ridiculous occurrences as golden chamber pots, we must concede that he had more than one objective in mind when writing Utopia. Many of the policies pursued by the Utopians are common sense practices which might have benefited More’s England. For example, it would have been good public policy to simplify the legal code in England because “it is most unfair that any group of men should be bound by laws which are either too numerous to be read through or too obscure to be understood by anyone.” Like the Utopian “custom of debating nothing on the same day on which it is first proposed,” it is a practical suggestion submitted in the interests of good government. Portions of Utopia represent perfectly reasonable models of reform, yet they are the products of a society of happy heathens who instantly accept Christianity when given the chance. Thus the reader should pause and ponder what it is that More is trying to tell us about how society can and should be ordered. A clue to More’s feelings in this regard can be deduced from the ironic observation in Book One that “well and wisely trained citizens are not everywhere to be found.” It is simply inconceivable that a devout Christian like More would seriously propose that postlapsarian humanity was capable of creating Utopia on in this realm. As gratifying as it might be to imagine Utopia, a place where “nowhere is there any license to waste time, nowhere any pretext to evade work–no wine shop, no alehouse, no brothel anywhere, no opportunity for corruption,” it is inimical to More’s Catholic cosmology to suggest that such a society is a serious earthly possibility. 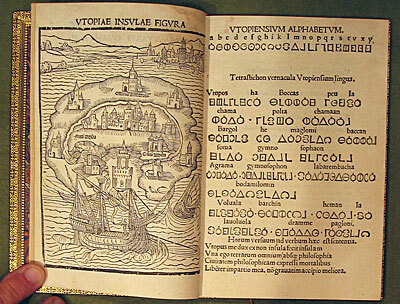 Thanks to Thomas More, the word Utopian has come signify anyone who would propose impractical visionary schemes. But this does not permit us to forget the fact that Utopia is a serious book which demonstrates not only the ubiquity of vice in any human community but also the impossibility that mere mortals could ever create a perfect world. However, this does not mean that it is futile to attempt to improve society. More was a thoughtful statesmen who worked to improve his country when he wasn’t busy burning Protestants. And hidden within the satire of Utopia are some serious proposals regarding how to build a better–though not ideal–world. This entry was posted on May 5, 2012 at 6:56 am and is filed under Essay. You can follow any responses to this entry through the RSS 2.0 feed. Responses are currently closed, but you can trackback from your own site.